Is This Not The Most Adorable Thing In Racing? CJ Wilson Racing driver Danny Burkett is at his home race at Canadian Tire Motorsports Park this weekend. For qualifying, he donned one of his older racing suits that is so Canadian, it makes me want to chug maple syrup and duct tape two K-Cars together for the Possum Lodge. Last weekend, we called Red Bull’s lederhosen suits the most adorable thing in racing. Those are still adorable, but can they beat a lumberjack racing suit that has an axe down the leg? No. No, they can’t. Because he’s a lumberjack, and he’s OK.
He’s also in one of the fastest cars in the Continental Tire Sports Car Challenge (a Cayman GT4 Clubsport), so he’s extra OK. Burkett and teammate Marc Miller barely missed out on the win last weekend at Watkins Glen, only losing the lead when they got stuck behind a lapped Mini with two laps left in the race. (At this point, Miller seriously needs a hug.) They start from second on the grid today so we’ll see how they do. Burkett races this afternoon at 12:25 p.m. Eastern, and you can watch it here. 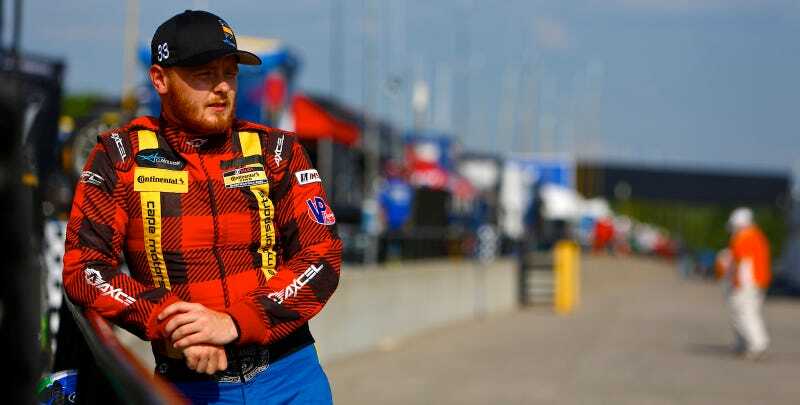 Regardless of how the race turns out this weekend, I am certain that recreating lumberjack flannel and suspenders in a nomex racing suit is the most adorable thing in racing. Final answer, no takebacks unless someone dresses up a GT3 Cup car as a lilac bunny rabbit.